With the yellow body of a lion, four golden wings, and a bright red elephant’s head, the hybrid animal, a gajasimha (elephant-lion), flings around seven small elephants using claws, trunk, tusks, and tail. Swooping down from above is a fabulously colored phoenix-like bird, a simurgh, which upends four more elephants in its tail feathers. 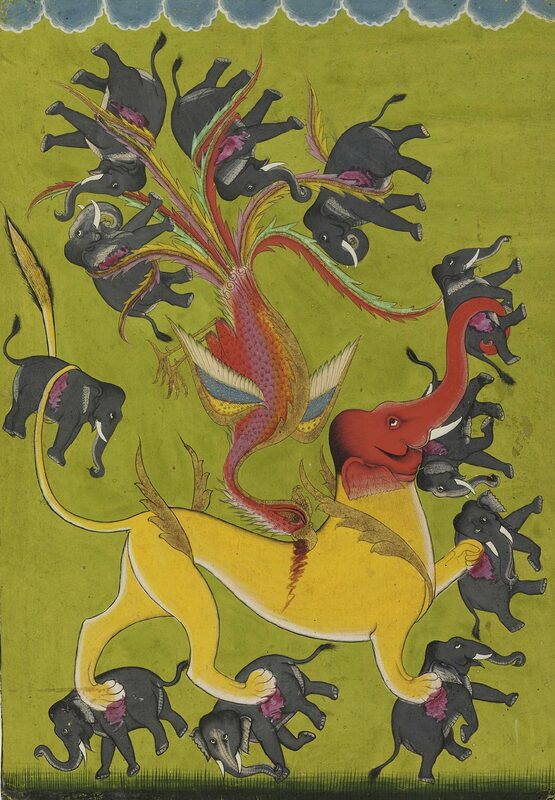 The ferocity of the battle is evidenced by the simurgh’s beak sunk deep into the gajasimha’s back, and the elephant’s wounds where the larger beasts grasp them. In Islam, the simurgh represents union with the divine. The motif was brought from Persia to India as early as 1600, where it may have merged with the sunbird Garuda, the vehicle of the god Vishnu.